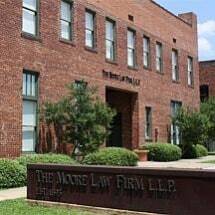 The Moore Law Firm, L.L.P., was established in Paris, Texas, in 1893 by W.F. Moore and Judge Leslie Hardison. Following in his father's footsteps, Hardy Goodner Moore was the bedrock of the firm for more than six decades until his retirement. Today, six attorneys assisted by nine staff members maintain a diverse practice that serves all of northeast Texas. We offer a variety of legal services in areas that include personal injury, family law, criminal defense, business law, real estate, estate planning and bankruptcy. Our attorneys strive to provide clients with comprehensive advocacy and counsel for all the legal issues they face. Many of our clients have been with the firm for many years, returning as new matters arise in their lives and businesses. We are rooted in our northeast Texas community and understand the issues and concerns of our clients. For example, we know that some potential clients may be hesitant to consult an attorney because of the expense. That is why our law firm accepts credit cards and will develop payment plans that fit the special financial circumstances of our clients. Of course, personal injury clients pay no attorneys' fees unless you receive compensation. Our law firm makes it easy to consult a lawyer in other ways. We offer flexible appointment scheduling to meet the needs of our clients. Our office is conveniently located across from the Lamar County Courthouse. We provide free parking and handicapped accessibility. In short, we welcome new clients to our office and work hard to make our legal services available to all.